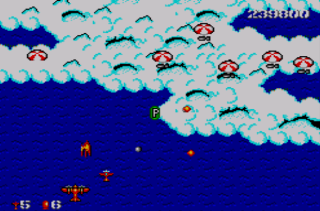 Taking its cues from Capcom classic, 1942, and a few similar games to a lesser extent like Flying Shark, Bomber Raid is a WWII-set vertically scrolling shmup which takes place over both land and sea. 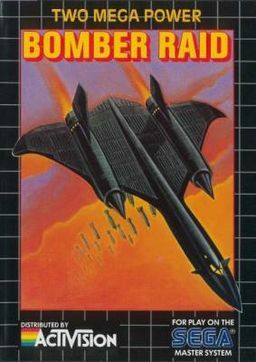 It’s interesting that the front cover of this game depicts an SR-71 Blackbird dropping a load of bombs as the actual game sees you piloting a far older and less sophisticated plane and any bomb-dropping you do is restricted to the three ‘cluster bombs’ your aircraft is equipped with! 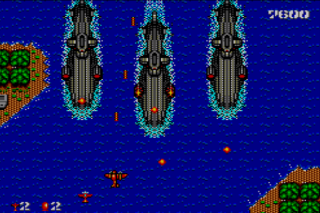 The game takes place over five stages, or ‘missions’ (you’ll receive a short briefing before each), all of which are filled with enemy aircraft, tanks, boats, submarines, and other associated vehicles, including of course much larger and more powerful bosses at the end of each stage. 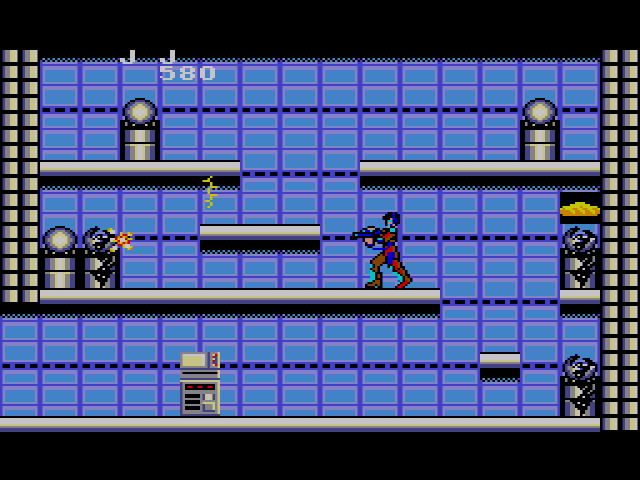 Amidst all the usual military-type enemies, you’ll frequently encounter spinning pods which release power-ups when shot. 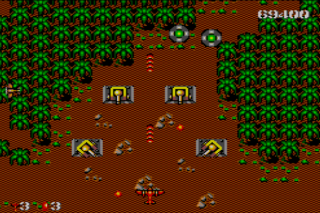 These include speed-ups, upgrades for your feeble main gun, and can also see smaller drone planes join yours and produce fire of their own, although they are just as prone to enemy fire as your main aircraft too, and you can also unleash the aforementioned cluster bombs which are screen-clearing smart bombs as you might expect. No, the arsenal isn’t particularly huge or impressive but even with the pretty limited resources available here you should make pretty good progress through the stages. The difficulty curve is just about right and there’s few overly tough parts that you’ll get stuck on. 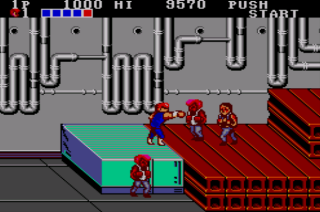 In fact, probably the biggest challenges offered by the game, at least initially, are a result of graphical issues! They’re pretty good, if lacking a little in variety, but the enemy fire is small and moves fast so it’s often hard to spot it, and the same can be said of some of the enemies themselves. Your own bullets, too, are practically invisible to start with making the acquisition of power-ups even more of a necessity! 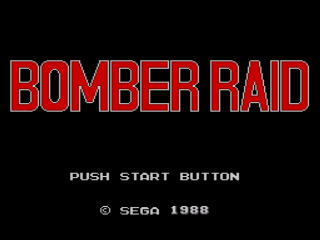 There’s also a bit of slowdown and flicker now and then too but aside from that, this is a decent enough looking game, and indeed a decent enough game generally. It was actually one of the MS games I always wanted to play but I never got around to buying it, so this is my first encounter with it, and happily it’s been a good one. 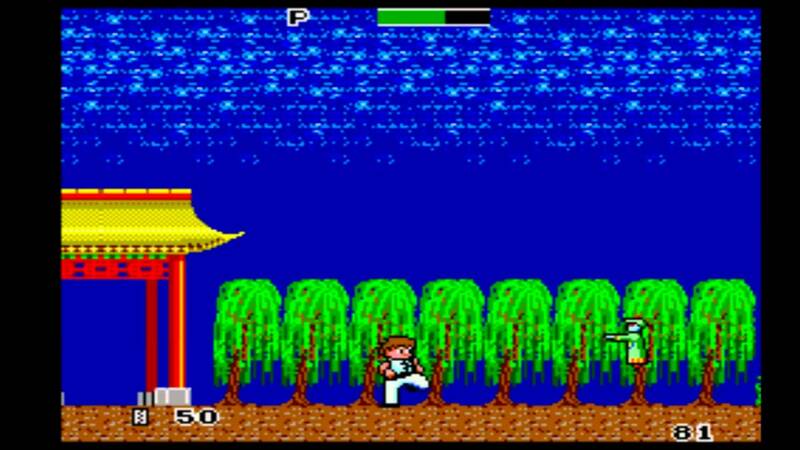 It’s not perfect and it’s certainly not the best vertical-scroller on the Master System (Power Strike retains that crown) but once you get used to the slightly confusing visuals it proves to be an enjoyable and addictive blaster, and a decent farewell for the Japanese incarnation of this great console.